People who pre-order games digitally on Xbox One and PlayStation 4 have been earning themselves an unadvertised and easily abused perk: the ability to rate, and sometimes review, video games that they have yet to play and aren’t even out yet. As a result, both online stores are full of star-ratings for games that haven’t been released. The Xbox One, which supports user reviews, displays dozens of user reviews written by people who haven’t played the games. A check of upcoming games on both stores reveals a lot of premature ratings and reviews. On Xbox One, for example, there are thousands of star ratings on the store page for next week’s Final Fantasy XV. Over on PS4, December’s The Last Guardian is already listed as a four-star game. This isn’t supposed to happen. The Xbox One and PS4 stores ostensibly block users from reviewing games they haven’t played by checking whether they’ve downloaded the games or not. If the user hasn’t, the page for a game listed on the Xbox One’s store will include the sentence: “You are unable to rate and review as you do not own this app.” On PS4, people who haven’t downloaded the game won’t see an option to “rate” the game. Buying a game digitally unlocks the systems’ review and ratings options. That’s reasonable. But simply pre-ordering an upcoming game digitally on either console also unlocks the ability to rate and review games. The pre-order loophole allows for piles of user reviews and star ratings for Xbox One games that haven’t come out yet. On PS4, which doesn’t support user reviews, pre-release games still have lots of star ratings. I tried the pre-order loophole on both systems and was able to easily exploit it. 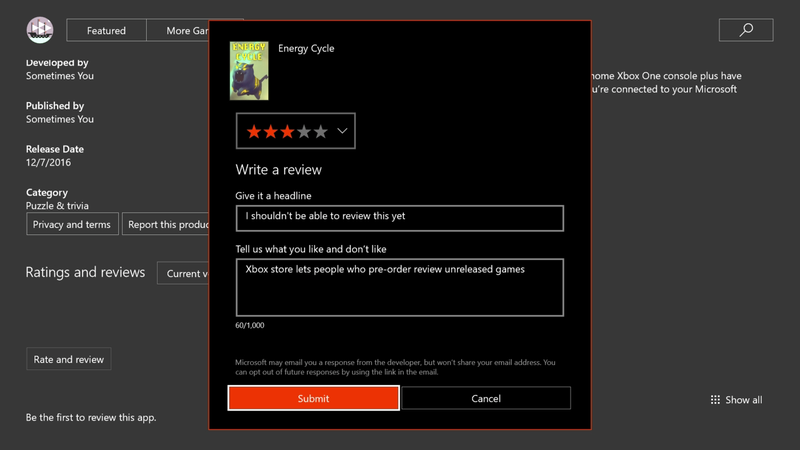 On Xbox One, I used a game called Energy Cycle to test things out. The puzzle game isn’t supposed to come out until December 7 but is available for pre-order now for just $2.99. And then I logged into the Xbox One using a colleague’s account, just to make sure my review really did go through. It did! I’ve reached out to representatives for Xbox and PlayStation to see what they make of this loophole and whether their companies plan to close it. I haven’t heard back yet. It’s unclear how much users of either system make their purchasing decisions based on user ratings and user reviews, but it doesn’t seem helpful to gamers to allow people who are in the anticipatory throes of pre-ordering a game to assess that game’s quality using only their imagination.